Have you noticed that the advice from new bloggers is often discounted by many people starting up their new blog? But it shouldn’t be this way. 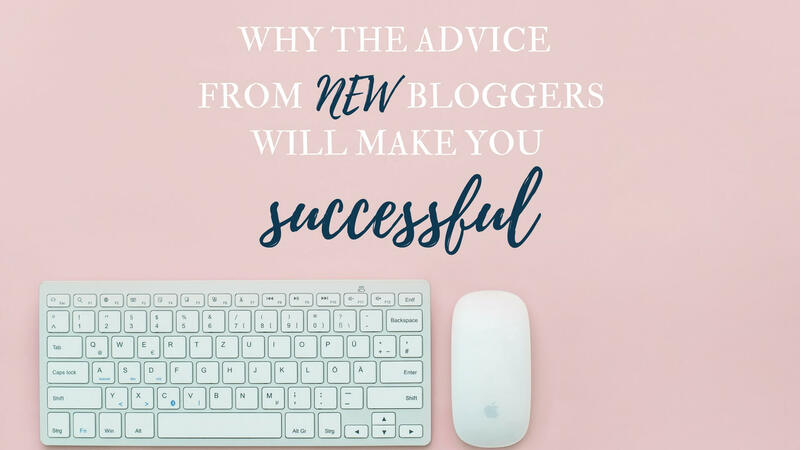 I do think it would be a mistake to underestimate how valuable the advice from new bloggers can be to your new blog and its path to success. Yes, I know what you’re thinking. Why on earth would you want tips from a fairly new blogger like myself when you can have easy access to the advice of experienced and successful bloggers? I hear you, why not learning from the best? And, yes, you’re right! By all means, you should seek the advice of experienced bloggers, read their articles, take their courses, check their website, their resource page, and their recommendation page. They have paved the way for us and are so generous to share their tricks. I have personally learned tons of useful information from them, and so can you. And actually, I’m going to recommend some awesome ones at the end of this post. 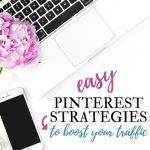 But one doesn’t exclude the other, and tips and advice from new bloggers who are knowledgeable and have tested some strategies with great results, definitely offer an added value and play an important role in making your blog thrive. Why? Here is the answer. And it’s a pretty easy one! While I have learned so much from experienced bloggers, some of the advice I have come across was not always easy to understand for new bloggers. In my first few weeks of blogging, reading posts written by seasoned bloggers usually went this way: “To enable rich pins, you first need to add the appropriate metadata” Wait, what? What’s metadata? ?, or “When using an affiliate link on your site, remember to add a rel=”nofollow””. A what? What the hell is a rel:”nofollow”? At the time, that was gibberish to me. I’m now at a stage where I can finally speak the lingo but I still remember that only a few weeks ago I didn’t know any of this and I don’t assume other new bloggers do. New bloggers give advice in plain language in a way that makes sense to a total beginner. 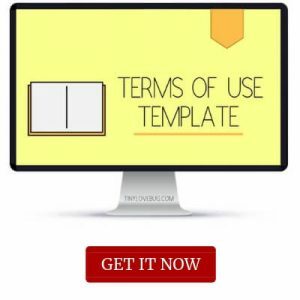 They may know the jargon, but they don’t overuse it because are yet to be fully accustomed to it. On the other hand, successful bloggers can’t always do that. And it’s not necessarily because they wouldn’t want to. It’s rather a physiological consequence of their huge following and very large audience. As established bloggers have a huge following and a very large audience, when they give advice they need to cater for bloggers at different levels, stages, and income points. So, they need to balance basic tips for new bloggers and advanced advice for more seasoned ones. They can’t always show how to do things step by step or explain what each word means if they don’t want to risk part of their audience getting bored or underwhelmed. On the contrary, new bloggers target other new bloggers. Because firstly, even with the best hopes, they can rarely teach seasoned bloggers anything they wouldn’t already know and, secondly, let’s be honest, not many seasoned bloggers would seek advice from a brand-new blogger. But that’s good news for you! All information is targeted to you, to your needs, to your level! 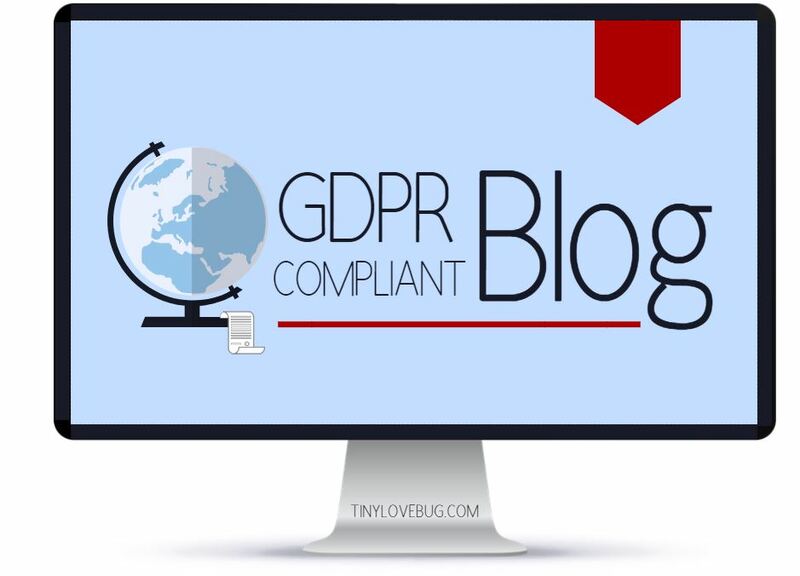 Is your blog GDPR compliant? Take my course and it will be compliant in less than one hour. 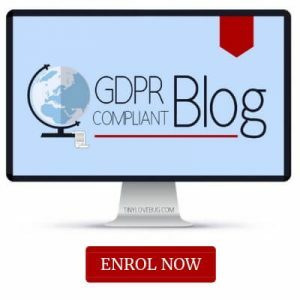 Most new bloggers, including myself, have created their website from scratch without technical knowledge or professional help. My blog is so new you can still see the embarrassing rookie mistakes I made at the beginning, and how I went/will go about rectifying them. You can spot the difference between what is done well and what is not. You can easily see the things that work and have worked. Although I think most successful bloggers came from humble beginnings and worked their way up, most of them have upgraded to a different site along the way or hired a team of pros. So, you can no longer see how things have improved over the months/years. I love reading success stories. They always give me a spike in motivation. Looking at the income reports of famous bloggers who make over $50K per month can be inspirational and can give you the drive to pursue your blogging career. But when you start comparing their reports with your monthly income of only few hundred dollars, there is the risk it may become daunting, instill self-doubt in you and lower your self-confidence. So, while inspirational, looking exclusively at their income reports may be counterproductive. If you look at the end result, it can seem unattainable. You will start feeling like you will never get there and you will become more likely to give up. Whereas, if you take it one step at the time, and rejoice at each of your little successes, you will stay focused and be likely to achieve the ultimate goal even sooner than expected. The key here is to remember that these bloggers have been around for years. Their success didn’t happen overnight, but it took a combination of the right strategy, perseverance, and hard work. So, instead of setting your own expectation too high, look at a combination of both income reports from famous bloggers to keep you inspired and focused on the end goal, and income reports from new bloggers who have gone from $0 to a few thousand dollars within a short timeframe. Read posts of new bloggers who have increased their traffic from hundreds of visitors to thousands in a short amount of time. Those are encouraging! Try to understand what has worked for them and follow their strategies. They’re likely to be winning strategies for you too. Very successful bloggers have a huge social media following, an email list of thousands and thousands of subscribers, the budget to advertise their posts, products or services, a team of web designers, VAs, social media managers, marketing managers and whatnot. Most importantly, their results speak for themselves. They have data to show. They have acquired credibility and authority in both their niche and in Google. But because of all of this, of course, their posts or products have a significantly wider reach than yours. On the other hand, new bloggers belong to your same league and they have access to your same limited channels. Therefore, their results are not inflated and if their strategy has worked for them, you can be sure it will work for you too. I don’t know about you, but I have come across some advice from famous bloggers that was so disconnected with reality it made me cringe. “If you want to drive more traffic to your blog, get interviewed by an international leading magazine in your niche”. I mean, this surely is valid advice and everyone should consider it down the line, but come on, what international leading magazine in your niche can’t wait to interview a new blogger with a dozen of readers and less than ten blog posts under their belt? Since people usually speak from experience, to drive more traffic to your blog, a new blogger may recommend something like “get your post on StumbleUpon”. Now, of course, StumbleUpon will drive less traffic to your blog than an international leading magazine, and it’s also true that due to the nature of the platform, the readers on StumbleUpon may not stick to your blog, but here you have a suggestion that can be easily and realistically implemented. You can try it straight away and see for yourself whether the exposure your post gets on StumbleUpon is worth it or not. Most famous bloggers offer courses, services, e-books and other products. Most of these courses are quite valuable and you should consider enrolling in them. Some are quite expensive though. And to be honest, it’s only understandable they would charge a premium fee. Firstly, they’re offering their expertise and the results of several years’ hard work. Secondly, everyone wants to learn from them, so their courses or services are obviously in high demand. Last, but not least, if you pay a premium fee, you’re more likely to take the course seriously and approach it with more motivation and commitment. I do believe that to make money you need to spend money, and if you’re serious about blogging, you should definitely invest in your blog. But, when you’re only starting out, you might not be ready to fork out thousands of dollars on a very expensive course just yet. There is no need for you to learn how to make a sale funnel whenyou don’t even have an opt-in yet and your email list is composed solely of your mum and your bestie, like mine used to be just a few weeks ago. So, my suggestion is to make a plan to enrol in expensive comprehensive courses or services in a few months when you’re a bit more established, your blog has started generating some income, you have clearer idea of what direction you would like your blog to take, and you are also less likely to get overwhelmed with all the resources and information to process and learn. In the meantime, pick a few valuable and affordable courses in line with the level you’re at, and get as much free advice as possible. Good news is new bloggers don’t usually charge for their tips! If you have just launched your blog, there are lots of benefits in seeking and following the advice of knowledgeable new bloggers. This doesn’t mean you should miss out on the awesome advice offered by some very famous bloggers. Depending on the direction you would like your blog to take and your future plans, I definitely recommend a couple of famous bloggers that offer super valuable advice and actionable tips. 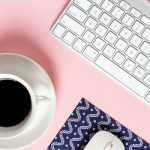 If you envisage yourself as a busy and successful entrepreneur and would like to take your blog to the next level, you should definitely read through Melyssa Griffin’s website. If your ultimate goal is to achieve a passive income that will allow you to live a dream lifestyle of travel and financial freedom, you can’t miss the advice of Michelle Schroeder-Gardner of Making Sense of Cents. They both make literally millions so they will keep you well inspired and dreamy! However, in addition, I would also recommend looking for easy-to-follow tips and practical advice from knowledgeable new bloggers. A couple come to mind: a newish blog (less than a year), Ladies Make Money and a very new one (less than six months), By Laura Iancu. 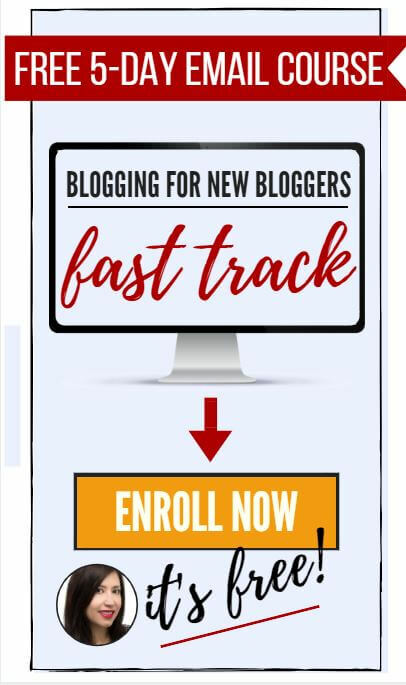 It would be foolish to dismiss their advice and miss out on the value they can offer to your new blog only because they’re fairly new to the blogging world. So, the bottom line is for your blog to thrive, you should aim to combine the advice of famous and established bloggers with the practical tips from knowledgeable and successful new bloggers. And, if you ever get stuck on something or have trouble understating the lingo, come to see me here and we will figure it out together! In the meantime, you may want to read how I went from less than 1K page views a month to almost 2K page views A DAY in my third month of blogging. Also, let me know what you think about getting advice from new bloggers in the comments below. 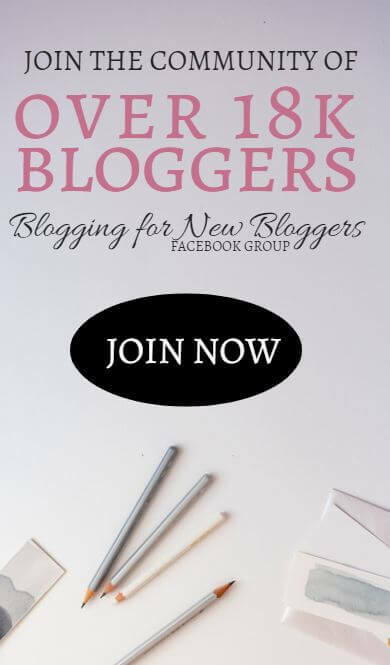 Our Facebook Group is a place where like-minded bloggers connect and grow together by sharing tips, establishing a real connection, fostering collaboration and promoting their blogs and social media accounts. 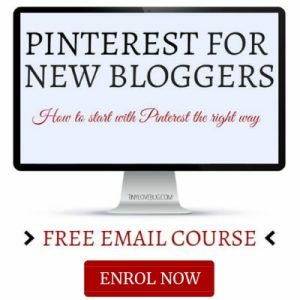 The Group is geared towards new bloggers but established bloggers are more than welcome to join too! 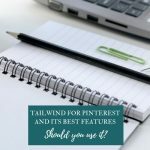 The benefit of Tailwind Tribes is that you can find high quality pins and add your own to be shared by other pinners. 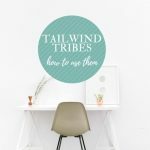 Tailwind Tribes are currently free to use and you don’t need to subscribe to Tailwind to join them. But, good news! The invitation to our Tribes also comes with a $15 credit should you decide to get Tailwind in the future! Great post Marina! So much truth to what you said. Glad to have connected with you and Lucrezia. Looking forward to reading more. I love this!!! I’m one of those new bloggers who simply loves helping others! 🙂 I can relate to how some advice from the bigger bloggers just does not apply at our level. One of my favorite things about blogging is the chance I get to take a confusing subject and make it simple and easy to understand! I can see myself doing this for many years, I just hope I never forget my roots when I’m well established. Great post! I found myself nodding along as I read. 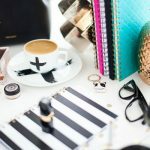 I have been blogging for just under 2 months so I can relate! True, I have learned a lot from fellow bloggers, since I started my blog, and their advice as made me become even more better and professional. Great insights in the post, thanks. Ah, finally I found people agreeing on this topic. Being a new blogger myself, I too approach new bloggers for their advice as it is completely honest and very useful. They don’t have any hidden intentions of marketing their own brand/blog. Thanks for sharing this and making us feel that there’s someone out there who understands us. I myself noticed that the advice given by experienced bloggers are not newbie friendly at all. One of the reasons is that most of them started in an era when the rules of the game were different and it was a lot easier to start. Therefore their advice simply doesn’t apply to someone who is just starting from scratch and trying to build their blog with no followers, no email list, no connections, no traction… You will feel cheated by their “expertise”… Except for a few exceptions that I really admire. When a new blogger figures something out and shares it with you, it will help you, because the person had to face similar problems to the ones you are having right now. I am new… I started my first blog in 2017, and my strategy is – solve the next problem then write a post about it. Now I have 5 blogs and each one is a different experiment. I don’t work on all of them at the same time. My main one is about monetizing your blog with sales funnels – it is really an unexplored treasure chest. I am building my sales funnel by being different from everyone and by providing insane value with posts that go really deep into the subject. I have another blog that I only build using SEO, and a third one that I will grow mostly through accepting guest posts. And the 4th one i just purchased an 8-year old domain, threw up a bunch of old content that used to be on the site and I will see what Google does with it. So true! Sometimes reading the advice of superstar bloggers is really discouraging because they seem to operate in a world which us newbie bloggers can’t understand at all (email subs in the 10s of thousands, page views in the millions!). Often their tips are more geared towards those bloggers who’ve already seen some growth vs. the real newbie. These are all great points. While my blog isn’t the first site I’ve designed, so it doesn’t feel quite as foreign to me, I completely agree that seasoned bloggers sometimes write in a way that would benefit someone trying to take their blog to the next level, more so than someone who is just starting out and needs new and creative ideas that don’t take years to accomplish. You are absolutely right. The newbies give out knowledge for free because they need the audience but the experienced have the target market and have the product to keep the audience for coming. I definitely agree with taking advice from the experienced who’ve been there done that without ignoring the less experienced. Good read! I have set up my blog but I’m still doing a lot of research. Thanks, Ruth 🙂 Congratulations on starting your blog! So exciting!